Conversations with Clara. Episode Two. Last night after we finished dinner, Clara decided to climb up on one of the dining room chairs and sit down. I thought I'd try something new since Clara is sometimes a little shy to sing with someone else. So I started singing and paused at intervals to see what she would do. Clara: (looks at me for a beat) Have any woo. Me: Yes sir. Yes sir. Clara: (shorter pause) Three bag full. Clara. (pause) Master. (pause) Dame. Me: And one for the little girl who lives down the lane. Clara: Baa baa black sheep. Clara and Me: Three bags full. Needless to state, this was met by a rousing round of applause from me and Gerald. Clara graciously joined in and clapped for herself. 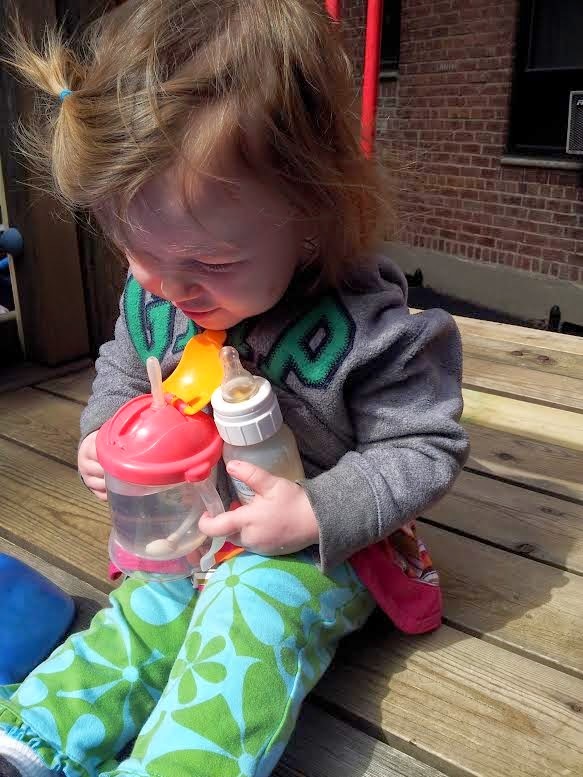 Clara, milk and water in hand, about to slide. Conversations with Clara. Episode One. Clara loves salad - especially cucumbers. And she calls cucumbers: pickles. The other night I made a salad with cucumber, tomato, cilantro, lettuce and some salad dressing. Seeking to participate in the dinner conversation, Clara delicately picked up a piece of cilantro that was covering one of her cucumber slices. With a smile dancing on her lips she said: "Pickle hiding." Gerald and I laughed and agreed - the pickle was hiding. I then encouraged Clara to try the piece of cilantro that had so cleverly hid the "pickle." She carefully placed the cilantro in her mouth. Made a face, pulled it out and exclaimed: "Not good." Clara is into trying out everything these days and asking a lot of questions. If she sees me doing something she quickly says: "I try." and tries to do it herself. A few nights ago, I flipped over our leather swivel chair to tighten some of the bolts. 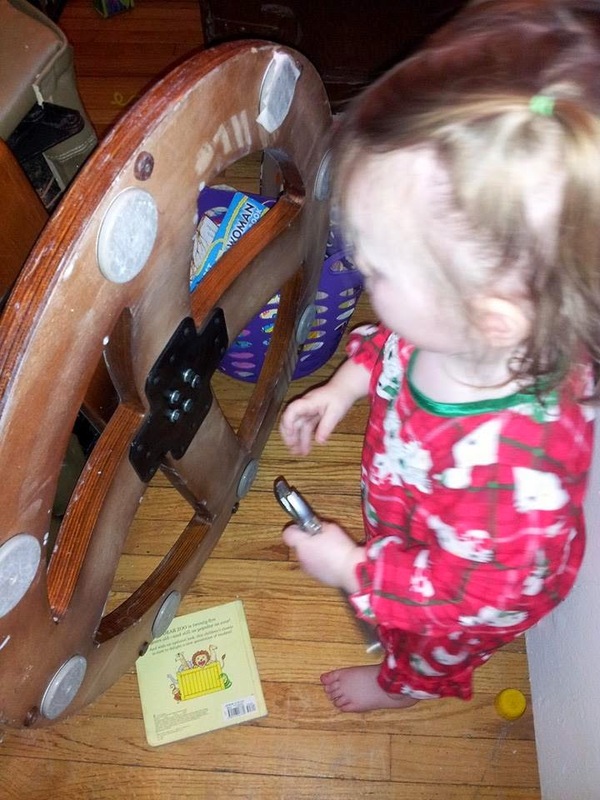 Clara saw the crescent wrench and said: "I try." After watching me tighten one bolt, she went in with the wrench and actually tried to tighten bolts. That same day, in the playground she decided to try going down the slide feet first on her stomach while whooping in delight. And then tried face first on her stomach but got her hands caught under her chest and did not whoop in delight - she cried - but bravely went and tried again. That night in the bath she discovered she could flip over in the water - almost submerging her face - and float. She kept saying: "Oooooooooh" I think to hear how her voice sounded underwater. She is also constantly trying to figure things out. Like crawling through this tube at the zoo. 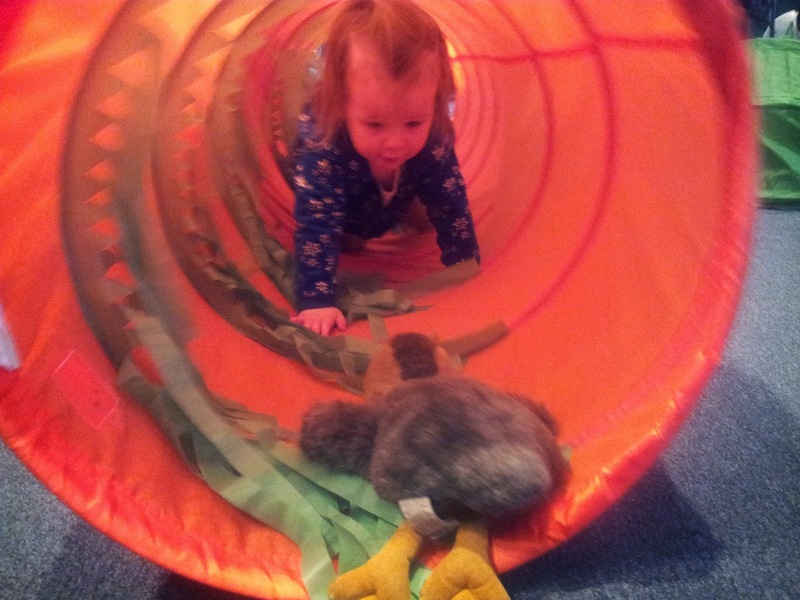 First she had to see that Gerald was on the other end - now she bravely scrambles through on her own. At the playground she spent 20 minutes figuring out how to pry up loose soil from the ground and then make tiny piles of dirt. She did not ask for my help, just worked at it intensely on her own. I love this exploration. 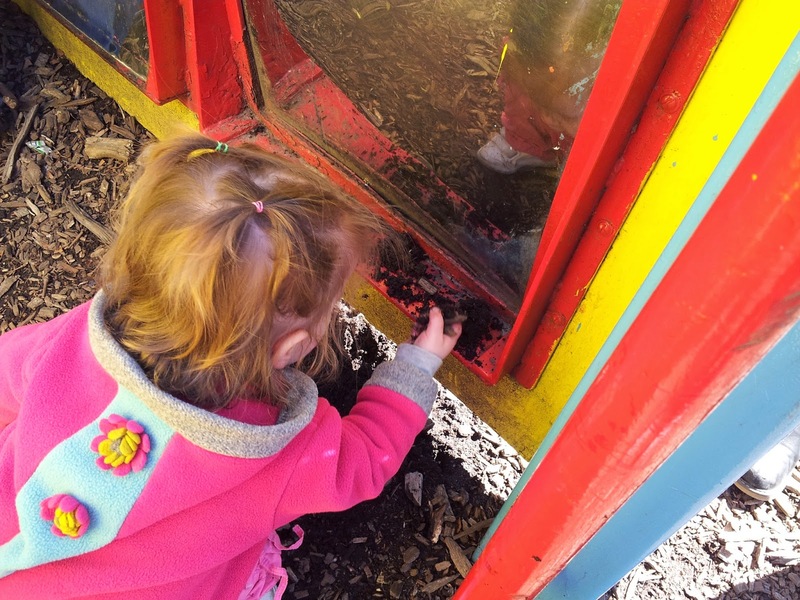 I loved digging for worms as a child - I can't wait to show her how to do that. She can also be a bit of a minx. This is the calm before the storm at a recent demonstration art class. 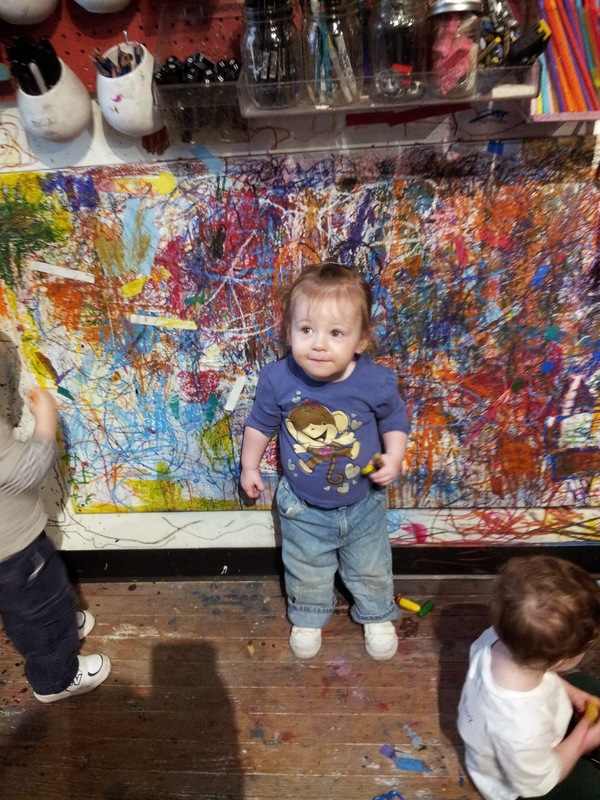 Clara probably drew for thirty seconds before she picked up the glue sticks and ran around evading my grasp while eating the glue stick like it was a popsicle. She is determined to understand everything. Up until this week, Gerald has managed to cling to some tattered shreds of privacy by insisting on closing the bathroom door while he is in there. I gave bathroom privacy months ago. I am used to Clara pushing back the curtain peremptorily while I shower - her gleaming mischievous eyes dancing while she throws tiny toys into the tub at my feet. Somehow this past week Clara muscled herself into the bathroom while Gerald was in there. He realized she was in there when he heard her piping little voice say:"Pee Pee Stand Up." As the last vestiges of his privacy blew away on the wind, Gerald was impressed by Clara's acumen.